MIT Media Lab spinout Ori aims to make that type of robotic living a reality. 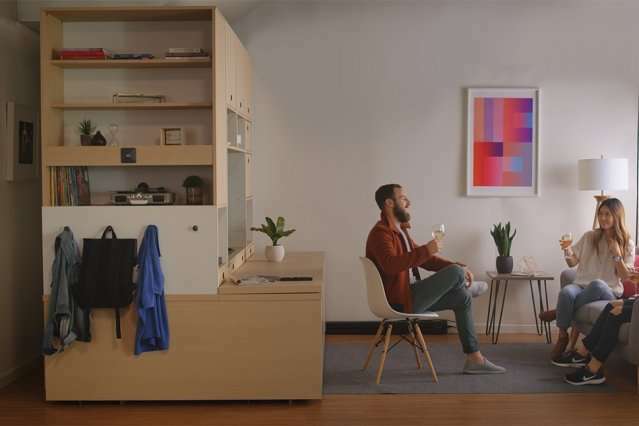 The Boston-based startup is selling smart robotic furniture that transforms into a bedroom, working or storage area, or large closet—or slides back against the wall—to optimize space in small apartments. Based on years of Media Lab work, Ori's system is an L-shaped unit installed on a track along a wall, so can slide back and forth. One side features a closet, a small fold-out desk, and several drawers and large cubbies. At the bottom is a pull-out bed. The other side of the unit includes a horizontal surface that can open out to form a table. The vertical surface above that features a large nook where a television can be placed, and additional drawers and cubbies. The third side, opposite the wall, contains still more shelving, and pegs to hang coats and other items. Users control the unit through a control hub plugged into a wall, or through Ori's mobile app or a smart home system, such as Amazon's Echo. Essentially, a small studio can at any time become a bedroom, lounge, walk-in closet, or living and working area, says Ori founder and CEO Hasier Larrea SM '15. "We use robotics to … make small spaces act like they were two or three times bigger," he says. "Around 200 square feet seems too small [total area] to live in, but a 200-square-foot bedroom or living room doesn't seem so small." Larrea was named to Forbes' 2017 30 Under 30 list for his work with Ori. "These technologies can evolve for kitchens, bathrooms, and general partition walls. At some point, a two-bedroom apartment could turn into a large studio, transform into three rooms for your startup, or go into 'party mode,' where it all opens up again," Larrea says. "Spaces will adapt to us, instead of us adapting to spaces, which is what we've been doing for so many years." In 2011, Larrea joined the Media Lab's City Science research group, directed by Principal Research Scientist Kent Larson, which included his three co-founders: Chad Bean '14, Carlos Rubio '14, and Ivan Fernandez de Casadevante, who was a visiting researcher. The group's primary focus was tackling challenges of mass urbanization, as cities are becoming increasingly popular living destinations. "Data tells us that, in places like China and India, 600 million people will move from towns to cities in the next 15 years," Larrea says. "Not only is the way we move through cities and feed people going to need to evolve, but so will the way people live and work in spaces." A second emerging phenomenon was the Internet of Things, which saw an influx of smart gadgets, including household items and furniture, designed to connect to the Internet. "Those two megatrends were bound to converge," Larrea says. The group started a project called CityHome, creating what it called "architectural robotics," which integrated robotics, architecture, computer science, and engineering to design smart, modular furniture. The group prototyped a moveable wall that could be controlled via gesture control—which looked similar to today's Ori system—and constructed a mock 200-square-foot studio apartment on the fifth floor of the Media Lab to test it out. Within the group, the unit was called "furniture with superpowers," Larrea says, as it made small spaces seem bigger. Drawing from that concept, the group built standardized components that could be assembled into a larger piece of modular furniture—what Ori now calls the robotic "muscle," "skeleton," "brains," and the furniture "skins." Specifically, the muscle consists of the track, motors, and electronics that actuate the system. The skeleton is the frame and the wheels that give the unit structure and movement. The brain is the microcomputer that controls all the safety features and connects the device to the Internet. And the skin is the various pieces of furniture that can be integrated, using the same robotic architecture. Today, units fit full- or queen-size mattresses and come in different colors. In the future, however, any type of furniture could be integrated, creating units of various shapes, sizes, uses, and price. "The robotics will keep evolving but stay standardized … so, by adding different skins, you can really create anything you can imagine," Larrea says. Going through the Martin Trust Center for MIT Entrepreneurship's summer accelerator delta V (then called the Global Founders Skills Accelerator) in 2015 "kickstarted" the startup, Larrea says. One lesson that particularly stood out: the importance of conducting market research. "At MIT, sometimes we assume, because we have such a cool technology, marketing it will be easy. But we forget to talk to people," he says. After earning one of its first investors in the Media Lab's E14 Fund in fall 2015, the startup installed an early version of its system in several Boston apartments for renters to test and provide feedback. Soon after, the system hit apartments in 10 major cities across the U.S. and Canada, including San Francisco, Vancouver, Chicago, Miami, and New York. Over the past two years, the startup has used feedback from those pilots to refine the system into today's commercial model. Ori will ship an initial production run of 500 units for apartments over the next few months. Soon, Larrea says, the startup also aims to penetrate adjacent markets, such as hotels, dormitories, and offices. "The idea is to prove this isn't a one-trick pony," Larrea says. "It's part of a more comprehensive strategy to unlock the potential of space." A trend of minimizing people's aspirations. Save the earth and live in your 100 sq ft apartment while the people directing your life cruise on their 50 million dollar yachts to one of their many 20,000 sq ft homes. are you a paid hack denier or are you one of the idiot volunteers they have spreading misinformation? Right Capt.,,,,Al Gore is a figment of my imagination as is all of the Hollywood types telling me to use just one sheet of toilet paper. @a_p Or this: "Honey, where are you?" [muffled] let me out!!! Yea, save toilet paper, meanwhile Europe is importing shiploads of LOGS from NA , not mill waste, to burn in their "renewable" power plants. Sorry man "THEY" are in control not you!!! It's a new market gimmick for Ikea. ,Al Gore is a figment of my imagination as is all of the Hollywood types telling me to use just one sheet of toilet paper. I wonder if it will have some kind of battery backup just in case of power outages? I just thought: what if Ikea made transformers? Capt. from what I gather you own the place you live in. Thus even if you home is small you have your own space which is enough for your body and soul. What is being pushed in this paper is for city renters. They want to have everyone live in the equivalent of a hotel room. I personally rebel at the thought of people being forced to live in cages like a chicken being trucked to market. is this tied to your unfounded fears of a singular world gov't and conspiracy? Capt. There is a huge push for micro - housing as a way to lower environmental impact and further crowd the cities. I personally don't think that is good for the mental health of the people involved. If one chooses to live in a small home on a piece of land that is great because there is still freedom of choice and no overcrowding. When done to increase population density in a certain area the crowding and confinement is unhealthy IMHO. Capt you might live in a small home but I am willing to bet that you also have a good size shed on your property. In order to have a real life people need to have tools and supplies. Almost all creative endeavors require some space to work and cannot be put back into a shoebox when the day is done. IMHO also, but that would mean destroying all the cities... so it's a matter of perspective, isn't it? what is the space for? is it required, or just convenient? Well Capt. I have a tool for just about everything from auto repair to drywall. There is not much that I hire a contractor for. The last one I hired was to replace the well pump. Oh yea my wife just had open heart surgery, and we decided it was too big a job to do in my garage. how often do you use them all? something about banjo's, squealing pigs, purty mouths and all that? I hope she is feeling better - watch closely for infection! She feels fine thanks. I pretty much use them all at least once a year. Between plumbing, cars, firewood, leaf blowing and remodeling I keep occupied when I am not bothering climate people on the internet. OK I do not really try to bother people it just happens to work out that way. Between plumbing, cars, firewood, leaf blowing and remodeling I keep occupied when I am not bothering climate people on the internet. OK I do not really try to bother people it just happens to work out that way. well, I can relate to the above except that my job actually requires me to "bother people"
The most interesting use case for this idea isn't a fancy city apartment, it's all those 12m shipping containers out there, which are already a popular target for low end housing construction. A 2.4m x 12.2m ( 8' x 40' in freedom units) space isn't much to work with, particularly on the narrow dimension, but I can see how sliding rails could change three small rooms into five. Funny to see the juvenile trolling above; it's a mix of paid losers in low wage foreign countries, and organic free range losers in the developed world. Someone should do a peer reviewed study on the ecology of the system.